I’ve posted about the patty melt, what seems like many moons ago, and it may very well be one of my favorite burgers. There is something about it, and yes it has beef, onions, cheese, and butter, and possible other items. It’s not for the faint at heart. This is a real deal burger and ones that typically will leave your fingers buttery, and possible your chin. Let’s just say it’s one that should be eaten, but probably once, maybe twice a year. Consider it a luxury item (at least I do), and even more luxurious when you jazz it up with some really awesome Nueske’s (or your favorite high quality) bacon. This patty melt, granted typically made with a beef patty, substitutes that burger patty with thick cut back. I mean thick cut. If you are making your own bacon, you can cut this as thick as you would like, but if you are not then please search for the thickest you can get. It’s worth every single bite. Start by cooking down your onions. To a medium sized skillet, add in the oil and bring to medium-low heat. Toss in all of the onions. Season with a pinch of salt, stir, and cook for about 30 minutes, stirring along the way. Low and slow is the key. During this time, cook your bacon. Again, go with another large skillet, medium-low heat, and let the bacon cook until crisp, flipping them from time to time. Reserve the bacon grease for later use and strain the bacon on some paper towel until ready to serve. Place a slice of bread, butter side down onto the skillet. If you are using mustard (I prefer), add it to the bottom slice. 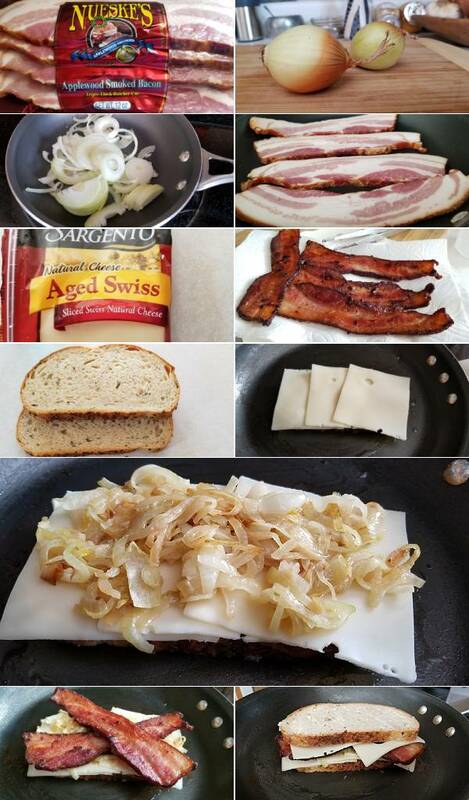 Add cheese slices to the bread, then load on the onions, top with the sliced bacon, add the remaining cheese slices to cover, and top with the other slice of bread, butter side up. Let this cook, untouched on medium-low heat for about 3-5 minutes, then light the bottom gently and make sure you get a good crust. You want that crunch. That buttery crust. Once nicely browned, gently flip over and toast the other side. Now you should be ready to plate and serve. Slice on the diagonal and dig in. This bacon patty melt is a force. You get that smell from the buttery bread, then just a light twang from the mustard, the pulling cheese and then KABOOM! That bacon and onion combination and then the final crunch. Oh my. I ate this. Did I feel guilty? Yes, I did but I thought life is short not to enjoy a sandwich like this once, or twice a year, and I know that I will be doing it again and again as long as that thick cut Nueske’s bacon exists. P.S. I like to serve mine with a pickle. A bite of that pickle cuts through those delicious bites and makes it even more enjoyable.